The MOTOmed muvi provides groundbreaking medical movement therapy by allowing patients to exercise legs and arms at the same time. With adjustable positioning and easy user adaptation, this new therapy device is the first of its kind to allow for simultaneous whole body training. 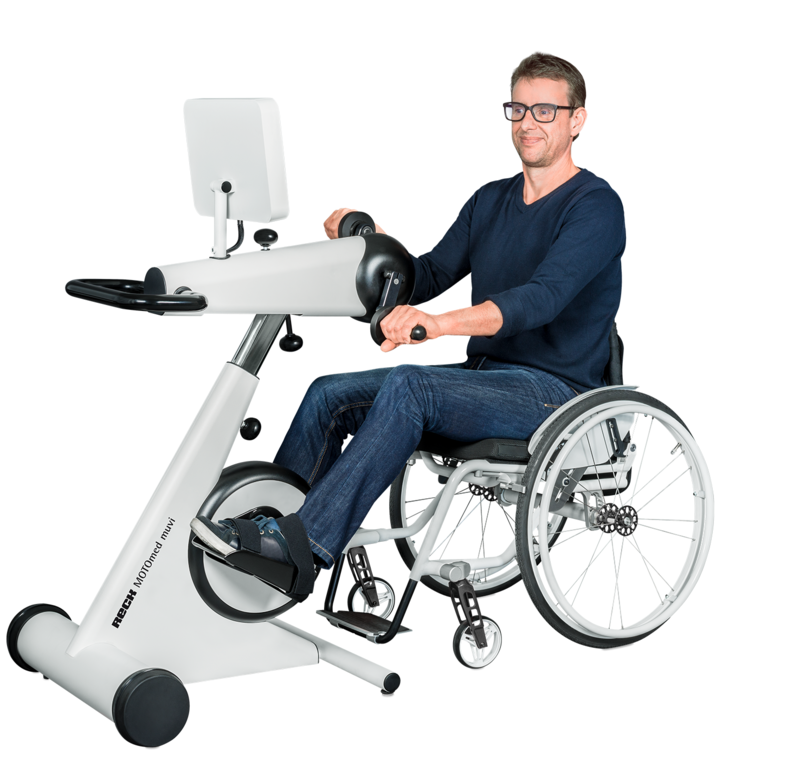 The muvi is an innovative piece of rehabilitative equipment that supports neurological, orthopedic and cardiovascular rehabilitation for patients suffering from neurological disorders, heart attack, heart disease, hypertension, stroke, diabetes and more. Created by engineers, doctors and therapists, the muvi allows a patient to exercise the whole body at once. The muvi provides simultaneous movement therapy, with whole-body training stimulating up to 80% of skeletal muscle mass and strengthening the body step-by-step. Built of high-quality, easy-to-clean and -disinfect materials, it is durable and easy to clean, making it an excellent investment for a rehabilitation center or hospital. The muvi provides several different training modes, depending on the condition and goals of the patient and his or her healthcare provider. Passive, motor-assisted and active resistive modes can be adjusted for patients depending on their conditions. 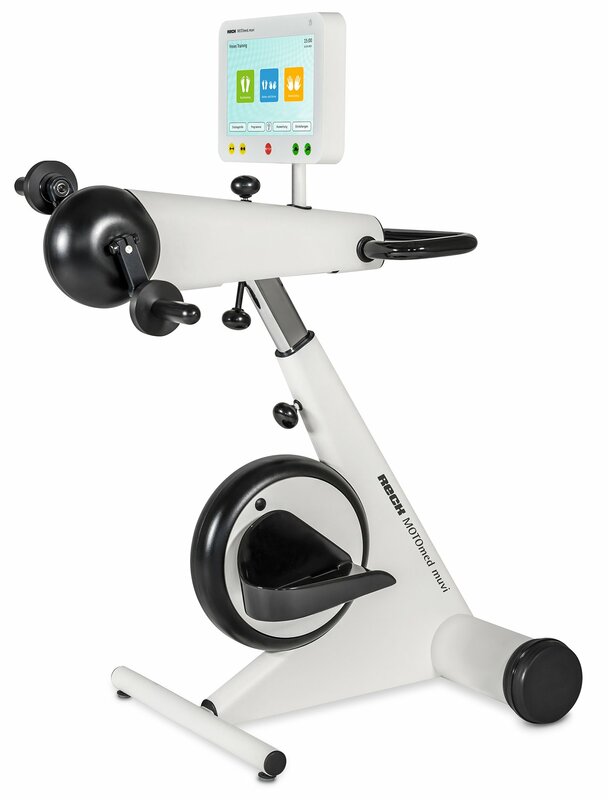 The passive training mode provides the patient with gentle, motorized movement. This mode helps reduce spasms and cramping, improves blood circulation and promotes overall physical well-being for the patient. The motor-assisted training mode provides supported movement. Patients are able to train using some of their own muscle strength. Using the touchscreen, patients can switch easily between motor-assisted and passive training. During the active resistive training mode, patients can adjust resistance levels, targeting specific muscle groups for optimal strength and endurance. The MOTOmed muvi device is capable of everything a modern therapy device must accomplish. It’s designed to accommodate the challenges of a clinical routines and provides a variety of movement patterns.